@otwcoverage Andrew Upshaw just upgraded again. He"s on about 19 plus change. Watch out for him at the weigh-in! @otwcoverage Here comes the rain again. Fishing has really slowed, but it's almost quitting time. @otwcoverage It's been slow going for Tim Malone. He has three for about 9 pounds. He's fishing near the Paris Landing bridge. @otwcoverage Redington just caught a 5 and culled. @otwcoverage Upshaw just boated a 3-pounder, but it went back. He needs to cull a couple of 3 1/2-pounders. @otwcoverage Last report on Haynes is that he is stuck on two bass, he needs to get something fired-up. 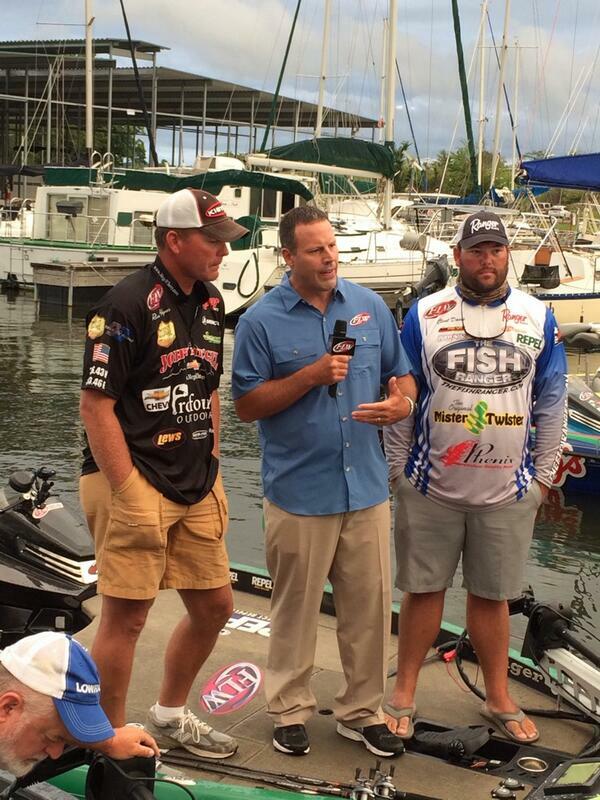 @otwcoverage It must be siesta time for the.bass where Andrew Upshaw is fishing. He hasn't caught one in awhile; still at 18-plus. @otwcoverage Hites school has finally fired up a bit. He has now culled once. @otwcoverage Canterbury is burning a lot of gas hunting the big 'un, so far not even another bite. @otwcoverage Clent Davis is tossing the giant spoon or as he calls it the "hubcap" and has 16 pounds so far. He says he's lost three big ones already. @otwcoverage Skip Johnson is now pushing his way to the 19 pound mark. @otwcoverage B Hite just put a four pounder in the box. He now has four bass for about 10 pounds. @otwcoverage Redington has a limit for 13 lbs. He's culled once and broke one off. He had a limit at 8:30. @otwcoverage A big shoutout to everybody following us. The pros appreciate you big time too. We"re not done today yet, but just wanted to say thanks. @otwcoverage Lambert just filled his limit with a 4 pounder. He has two small ones to cull. @otwcoverage Upshaw's upgrading several ounces at a time now, all on swimbaits. He's got every bit of 18 pounds. @otwcoverage Scott Canterbury has put a lot of miles on his Ranger this week; he was in Barkley yesterday and New Johnsonville today. He has a limit. @otwcoverage Lambert is stuck on 4. Working his way north. Lots of searching for schools. @otwcoverage Upshaw's 5-pounder now gives him 15 pounds. He"s using swimbaits, a crankbait and drop-shot rigs and really working his spots over. @otwcoverage Skip Johnson with a limit for about 15 pounds. He is fishing the same triangle he's been on all week. @otwcoverage Andrew Upshaw just upgraded with a toad. He's still got a couple more he needs to replace. @otwcoverage Moynagh is culling now. He just gained 2 pounds with his last cull. @otwcoverage Haynes made a move and hooked up right away. But it spit the spoon at the boat. @otwcoverage Not sure exactly what happened but some part of Haynes' tackle broke. He had to hand line one in and lost it at the boat. @otwcoverage Andrew Upshaw just caught a 3-pounder and culled a dink. He's at about 12 pounds. @otwcoverage After a short lull Moynagh boxed two fish quick to round out his limit - one of which was in the 4-pound class. @otwcoverage Tom Malone with three on board, one nice one. He is fighting three foot waves. @otwcoverage Andrew Upshaw has a decent limit and is working to cull some. He made a longer run to a different starting point this morning. @otwcoverage Another 3.5 for lambert. First one on the giant metal! @otwcoverage 3.5-pounder just found it's way into Jason Lambert's boat. @otwcoverage A short fish for Haynes. That won't do him any good. @otwcoverage Moynagh is dialing them in after boxing a 3 1/2- and 5-pounder. @otwcoverage Now Lambert has two. @otwcoverage Lots of stinging rain to get to Jason Lambert but he has his first keeper! @otwcoverage Live video feed from top-10 boats has been suspended due to weather, when conditions improve we will resume feed. @otwcoverage Ouch. Haynes lost another. And he's not losing them on a spoon. @otwcoverage Jim Moynagh breaks the ice with a solid 4-pounder. @otwcoverage Randy Haynes has a keeper in the box. @otwcoverage All the boats are in and headed for the Paris Walmart. Lots of big bags. Tune in for an exciting weigh-in. @otwcoverage Andy Morgan just exchanged a 2-pounder for a 4-pounder. The lake is really rough. @otwcoverage Co-angler Jason Johnson picking 'em off one at a time, but nothing he can cull with. Fishing License: Tennessee waters require a Tennessee license. Kentucky waters require a Kentucky license. Call 877-4982401 for a Kentucky license. Call 800-814-8972 for a Tennessee license. Off Limits: See Rule #13 of the official rules (see map at www.flwoutdoors.com). Competition waters include all waters of Kentucky Lake (except the Paris Landing State Park Marina) and all waters of Lake Barkley to the Tennessee State Line (all Tennessee waters on Lake Barkley are off limits). All competition waters are off limits June 9-21, 2014 and June 25, 2014. Service Trailers will locate at Paris Landing State Park on June 23, 2014. The top 10 boats will be located at the Paris Landing Marina.